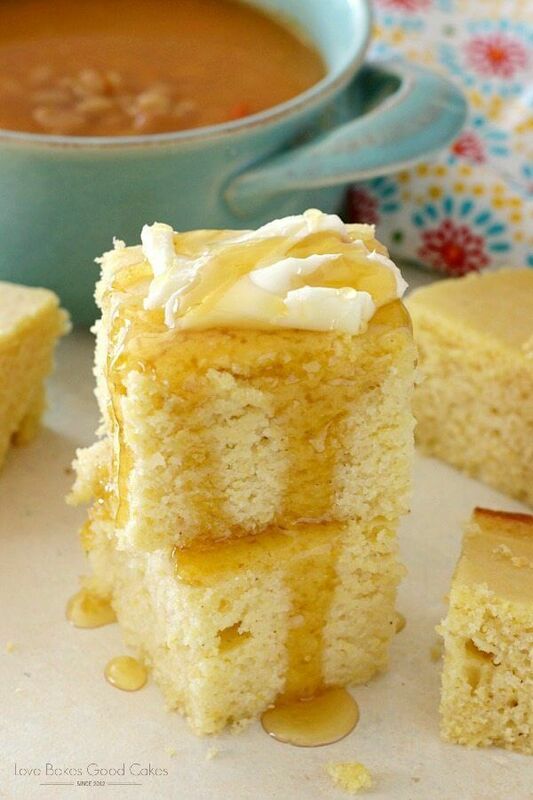 If you like your cornbread on the sweeter side, then THIS Southern Cornbread recipe for you! You’ll want to serve it with everything! There are a few recipes that I feel everyone should have. 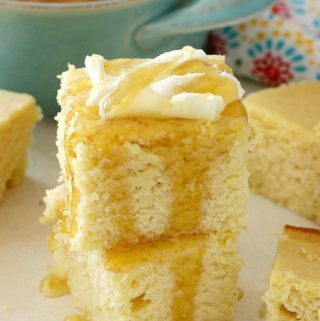 This Southern Cornbread recipe is one of them! 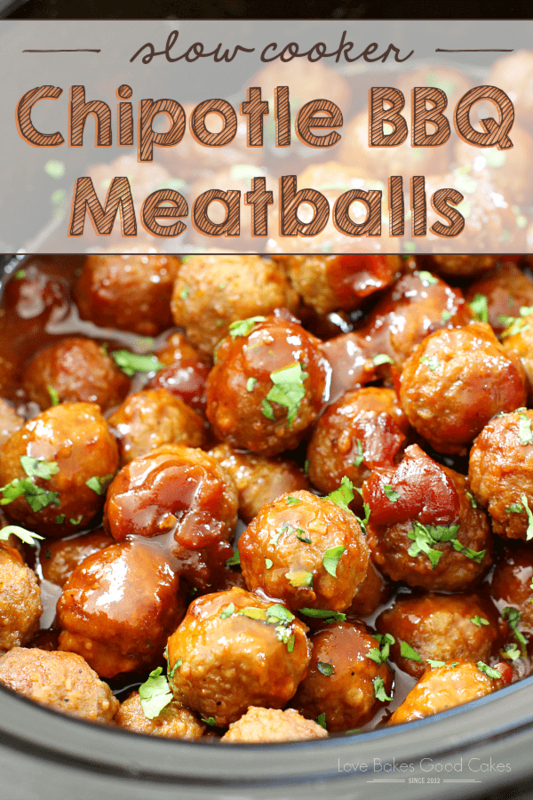 It goes with so many things, is easy to whip up, and it is amazeballs. My husband loves the leftovers – and often claims plenty for himself! 😉 Unlike many cornbread recipes, this one is not gritty. I’m not a big fan of gritty cornbread. 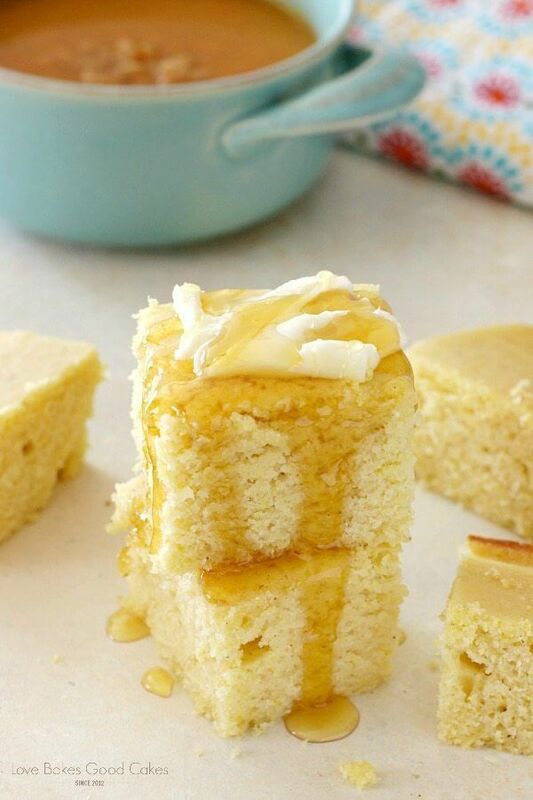 This recipe produces a thick, slightly cake-like, cornbread that is to die for! Everyone has their quirks. When it comes to brownies or cornbread, I’m an edge-type of person (corners preferably) – my husband like the middles. I’m not suggesting that’s the secret to a happy marriage, but it sure helps. 😊 No matter if you prefer middles or edges, this cornbread is so simple to whip up. 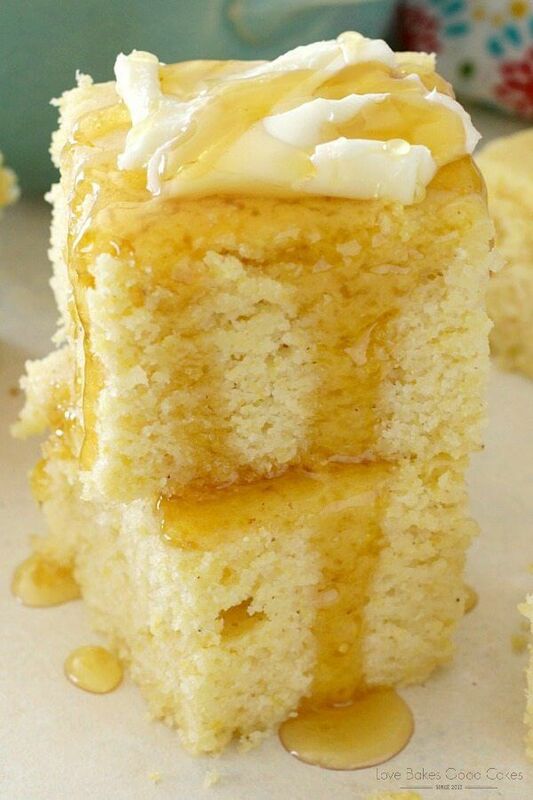 Slather on some butter, maybe a drizzle of honey …. mmmm hmmmm and take a big ol’ bite! 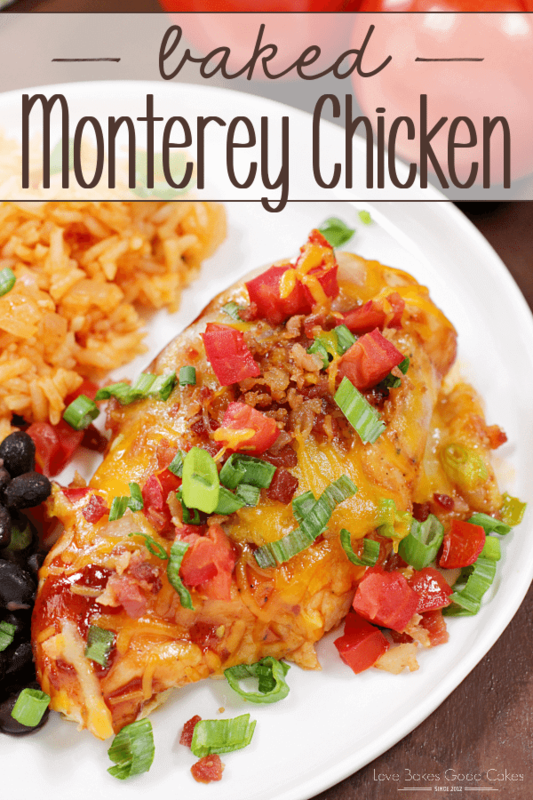 Preheat oven to 400° F. (If using a glass baking pan, lower the oven temperature to 375° F.). Grease a 9x13x2-in. baking pan and set aside. Combine cornmeal and milk in a small bowl and allow to rest 10 minutes. Meanwhile, in a large bowl, combine flour, baking powder, salt, and both sugars. Mix in the cornmeal mixture, eggs and oil until smooth. Pour mixture into the prepared pan. Bake for 30-35 minutes or until a toothpick inserted near the center tests clean. This cornbread looks so good Jamie!! Pinning to try! Thanks!! Jaye @ Just Trying to Make Cents of it All! I found your blog through Beez Rental Designs and so glad I did! I just did my entire weeks menu using your recipes. Was about to head to the grocery store not having ANY idea what to buy or cook! You saved the day!! This pic looked so good and I've never made cornbread with brown sugar so I will have to give it a try. Thanks for posting it! I'll tell you a secret Jamie – I'm not very familiar with cornbread…. I like what I see and I like your recipe! I love cornbread and have been looking for a great recipe to make. Thank you for sharing this. Always wanted to make corn bread. Looks good. Cakes and brownies, give me the middle. Cornbread give me the corner(s) or else. lol Yummy recipe. No true southerner would EVER call this recipe, 'southern cornbread'. Cornbread is made with cornmeal & buttermilk. It's supposed to be gritty, and dense, not sweet and fluffy like cake. This label on this recipe is truly an affront to my Southern heritage. Real cornbread is savory, not sweet. 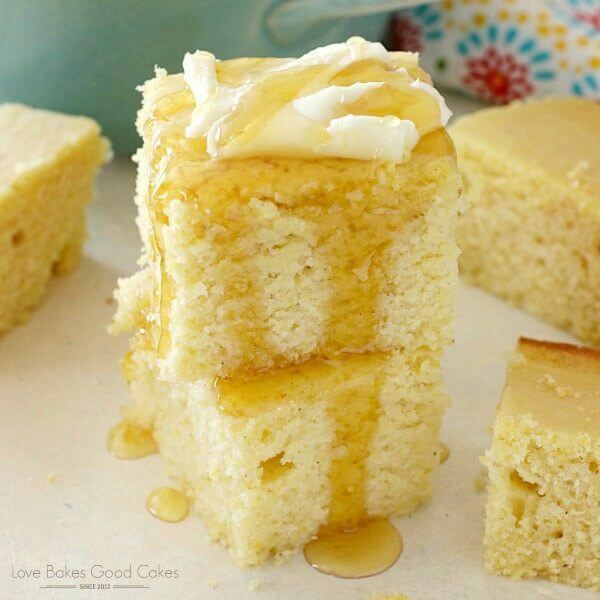 Even those boxed corn muffin mixes are sweet…. but notice they aren't called cornbread. Why? Because it isn't, & neither is this corn cake that you are trying to claim as "Real Southern Cirnbread".